Apple took to the stage in Cupertino, California to announce their latest and greatest products, the first of which is the iPhone 6. As rumored, there are in fact two version of the phone, the iPhone 6 and the iPhone 6 Plus. Both models have a continuous, seamless design whereby ion-strengthened cover glass curves around the sides to meet an anodized aluminum enclosure. Both iPhone 6 models feature a new Retina HD display, the best display in the industry and are the thinnest iPhones ever made. iPhone 6 has a 4.7-inch display. iPhone 6 has over one million pixels. iPhone 6 has a resolution of 1334 by 750 with 326 pixels per inch, more than 720p HD. iPhone 6 is 6.9 mm thick. iPhone 6 Plus has a 5.5-inch display. iPhone 6 Plus has over two million pixels. iPhone 6 Plus has a resolution of 1920 by 1080 with 401 pixels per inch, full 1080p HD. iPhone 6 Plus is 7.1 mm thick. There’s also a special landscape mode for the Home screen, but there’s a lot more to the new iPhone than a larger display. The iPhone 6 and iPhone 6 Plus are powered by the Apple-designed A8 chip which means the iPhone 6 Plus will play games in higher resolution than next generation consoles. Graphics are an incredible 84 times faster than the original iPhone and processor performance is 50 times faster than the original iPhone. The camera is a lot better. iPhone 6 has an 8MP iSight camera, 1.5µ pixels, ƒ/2.2 aperture with an all-new sensor equipped with Focus Pixels, a technology previously found only in professional DSLR cameras. This allows the iPhone 6 focus faster and better, with next-generation local tone mapping, and advanced noise reduction. Optical image stabilization allows for great shots in low light or with shaky hands. In burst mode iPhone 6 can take up to 10 photos per second. iPhone 6 has also made incredible advances in video, you can now capture slo-mo video at 120 fps or 240 fps. Continuous autofocus means focus changes are automatic and almost undetectable. Phone 6 and iPhone 6 Plus come with iOS 8 (available as a free download September 17.) It’s the biggest iOS release ever with great new features including the option to add voice, video, and location to any message. A predictive keyboard learns your conversation style, while the new Health app gives you a detailed look at your health and fitness data. There are also notification extensions from your favorite apps, as well as Touch ID. 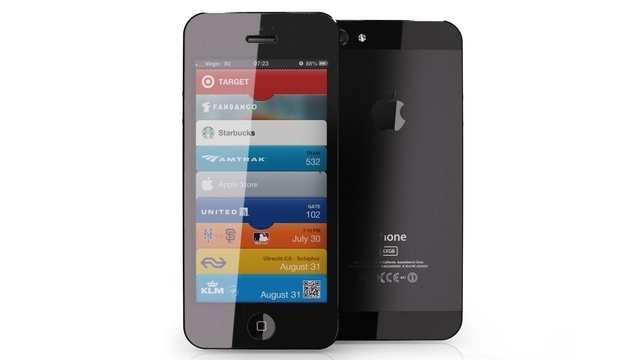 Apple Pay will be included in iPhone 6 – The vision is to replace the wallet, starting with payments. With a groundbreaking NFC antenna, the security of Touch ID and the convenience of Passbook it’s an easy, secure and private way to pay. You can pay with the simple touch of your finger using Touch ID. Online you can check out with one tap for app purchases. Apple Pay works with most major banks, all 3 major credit card companies and will be available in the U.S. in October 2014. New Apple-designed silicone and leather cases will be available in multiple colors, including (PRODUCT)RED. iPhone 6 starts at $199 with a two-year contract, the iPhone 6 Plus starts at $299 with a two-year contract and both phones come in gold, silver, and space gray. 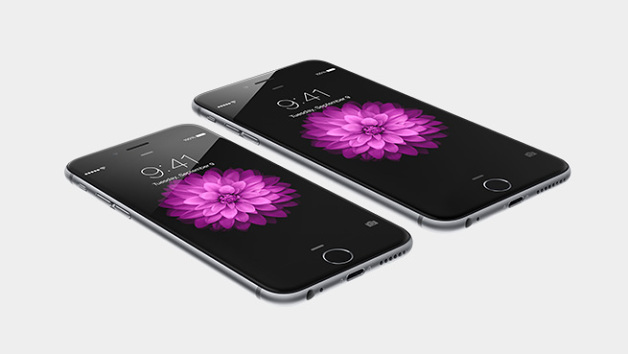 iPhone 6 and iPhone 6 Plus are available September 19 in select countries, and will be coming to more soon after. 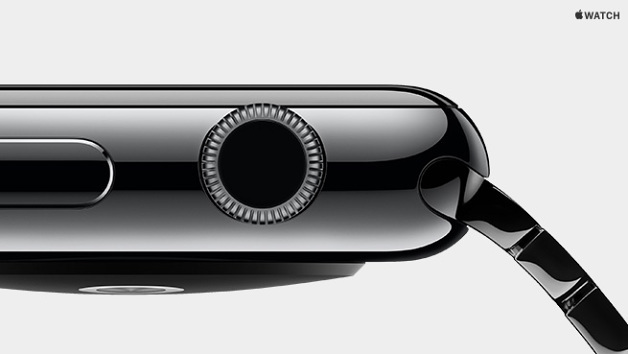 The key development with Apple Watch is the Digital Crown. 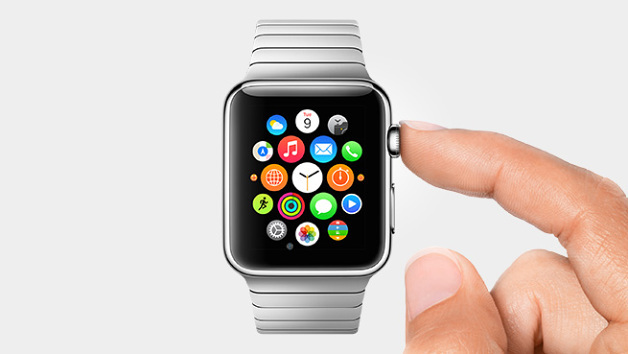 The Digital Crown allows you to scroll, zoom, and navigate Apple Watch without covering the display. It’s a versatile tool that answers the fundamental challenge of how to magnify content on a small display – you can magnify content, scroll through lists and messages, and make selections. All without obstructing the screen. With a flexible Retina display the Apple Watch is laminated to a single crystal of sapphire, the hardest transparent material after diamond. 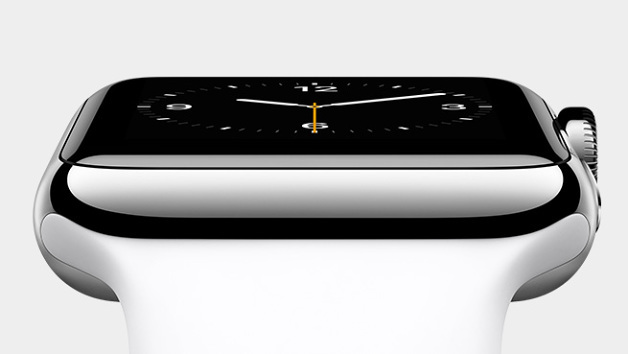 It is Apple Watch is built from custom alloys of stainless steel, aluminum, and 18-karat gold. With bands as thoughtfully designed as the watch itself in leather, metal or plastic. There are a range of watch faces and millions of ways to personalize them. 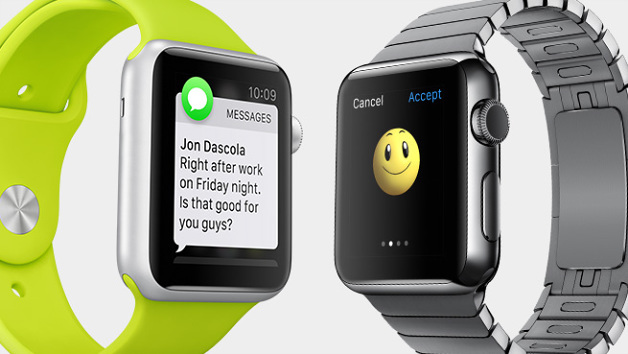 You can receive and send messages in amazing ways — from your wrist. You can send preset phrases, smart responses based on your conversation, audio messages, your location — even interactive emojis. 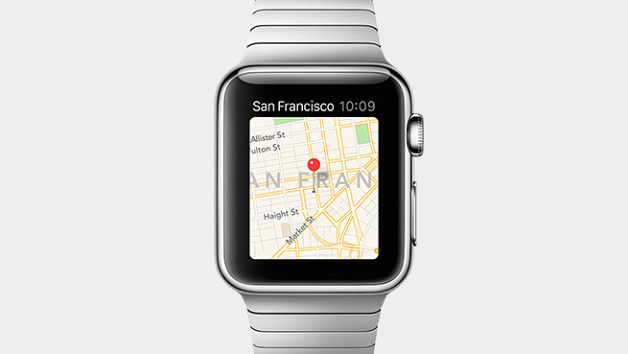 Apple Watch also has Siri so you can dictate a message, check your calendar, find the nearest coffee shop, and more. Maps doesn’t just show you the way, it guides you to go right or left with a tap. Apple Watch comes with two apps that give a complete picture of your health and fitness. The Activity app monitors movement throughout the day while the Workout app tracks dedicated workouts. A custom sensor measures intensity by tracking your heart rate. It also has an accelerometer to measure body movement while the GPS and Wi-Fi in your iPhone help track your distance. Apple Watch requires either an iPhone 5, 5c, 5s, 6, or 6 Plus. 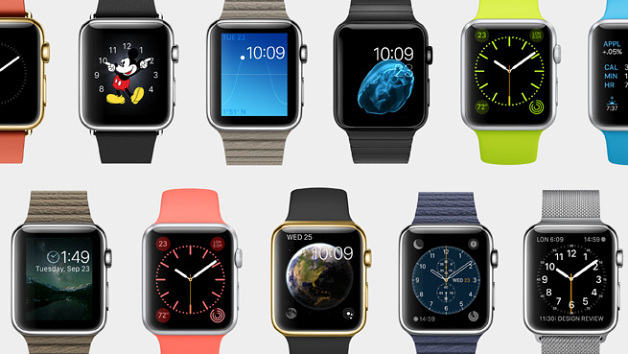 It will be available in 3 versions – Apple Watch, Apple Watch Sport, and Apple Watch Edition. Available early next year. 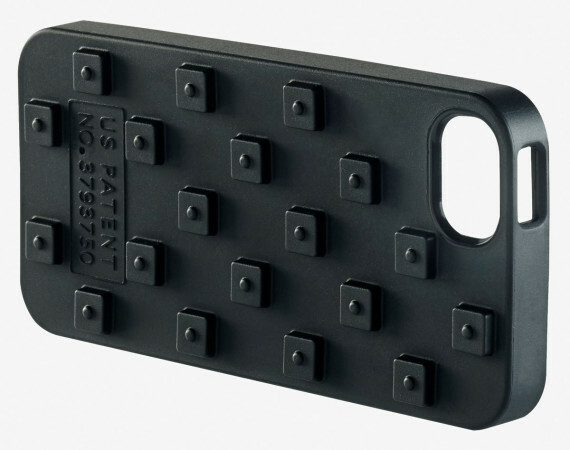 Perhaps seeing the popularity of the Belkin x VANS Rubber Waffle Sole Cases for iPhone 5/5S, Nikedecided to follow suit with its own version. 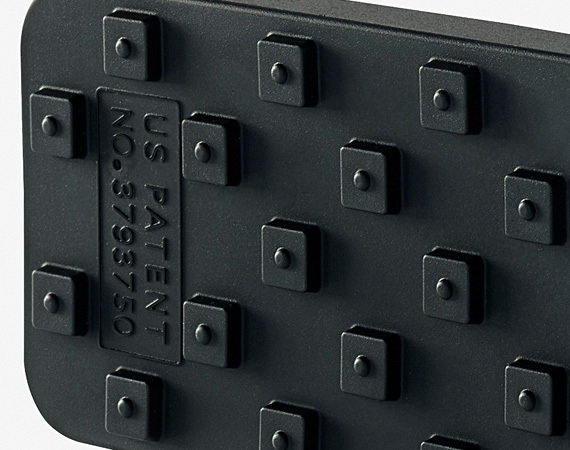 Though not as identifiable as the version by VANS, Nike devotees will recognize the studded outsole design that Bill Bowerman perfected with a simple waffle iron. 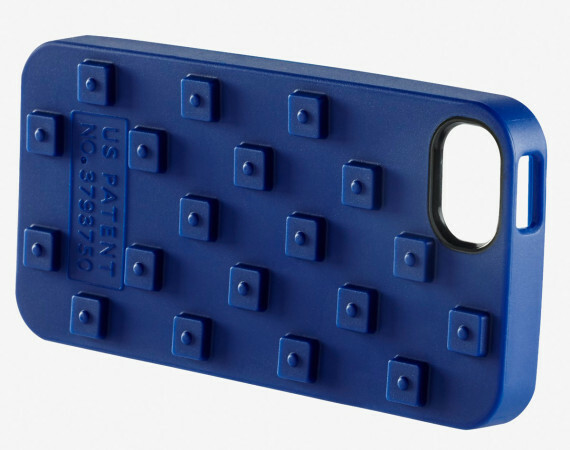 The case also features the original US Patent No. 3793750, one granted to Bowerman in 1972 for his new “Athletic shoe for artificial turf” design. Fits either an Apple iPhone 5 or iPhone 5S, the Nike Waffle Soft Case for Apple iPhone 5/5S comes in Black, Blue or Green. The trio is available through NikeStore.com. 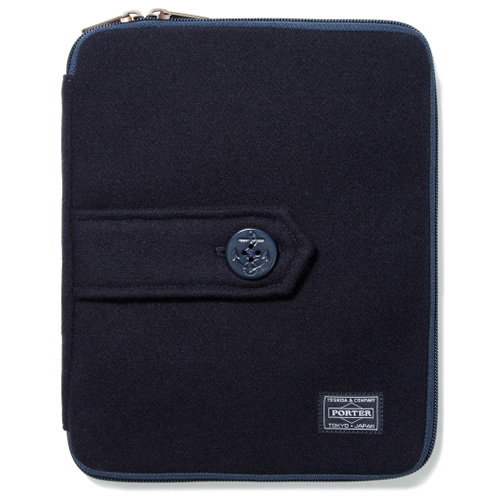 Head Porter and Dr. Romanelli show some love to the ol’ peacoat with a wool case for the iPad dressed just like the classic naval staple. The zippered case is detailed with navy blue wool, striped webbing, and an epaulet adorns the front complete with a Peacoat button. As the anticipation was building today leading up to Apple’s WWDC, the much talked-about iPhone 5 has officially been unveiled. 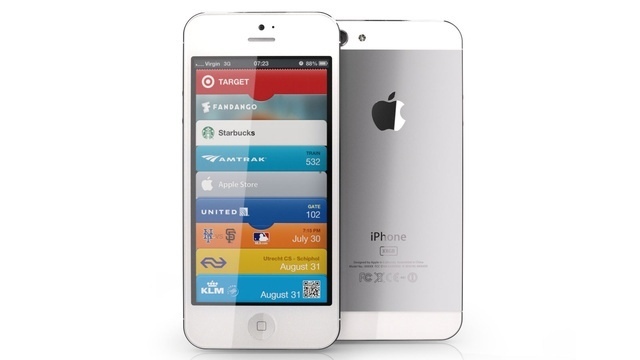 The iPhone 4/4S successor is expectedly impressive with an all glass and aluminum body and structure. Living up to much of the rumors and early grapevine conversations, the iPhone 5 arrives with some subtle and other substantial changes. Touted by Apple as the world’s “thinnest smartphone,” the phone weighs in at 112 grams and is 7.6mm thick and 18% thinner than before. Taller than the previous generation phones, the iPhone 5 boasts a 326ppi Retina display with a four inch screen at 1136 x 640 resolution. The screen is the same width as previous models yet slightly taller. Offered in two colors, white or black, the white body style will feature an aluminum backing while the black iteration will feature a black anodized backing. The increased screen size also bumps up your springboard space bringing about five rows of icons in addition to the shortcut bottom row. All of the Apple first party Apps have been updated to be optimized for the new screen including the iWork suite as well as iMovie and GarageBand. 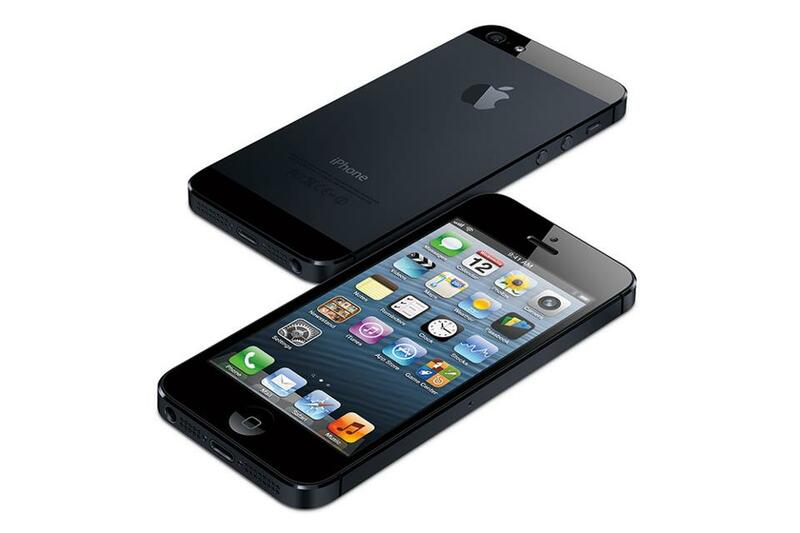 Numerically, the iPhone 5 takes it to the next step and includes a powerful A6 Processor inside which is expected to bring 2x CPU processing as well as 2x graphics performance while still consuming less energy. The A6 processor is 22% smaller than the previously installed A5 processor. 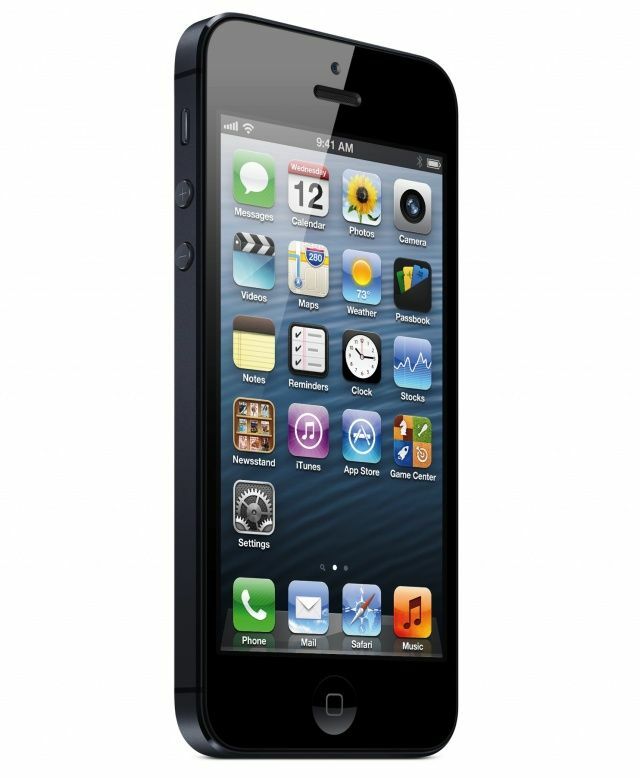 The iPhone 5 will run on LTE — meaning the phone will operate on the fastest cellular data network around. For U.S. cell phone providers, you can expect Sprint, AT&T and Verizon to run the iPhone 5 on LTE initially. Apple has improved the battery life of the new iPhone with an expected talk time and browsing time of eight hours on 3G or LTE while WiFi will run you about 10-hours talk time/browsing. The phone’s camera has been slightly downsized (approximately 25% thinner), although it features the same iPhone 4S, 8-megapixel camera at an f/2.4 aperture. It also features a dynamic low light mode intended to improve image quality within low light conditions. Video has been improved to film at 1080p with face detection, improved image stabilization and the user can also take photos while filming video. The front facing camera will film at an improved 720p, for HD FaceTime and will also include backside illumination. Perhaps one of the most notable changes of the iPhone 5 is the creation of a new connector which is being called, “Lightning.” Doing away with the old iPod connector, Lightning is 80% smaller than the previous connector and is reversible creating a more user friendly, ease-of-use. When I first spotted those leaked images of what was claimed to be the next-generation iPhone’s rear panel, I wasn’t keen on the two-tone aluminum look, and I found myself wondering what Jony Ive was up to inside Apple’s design labs. 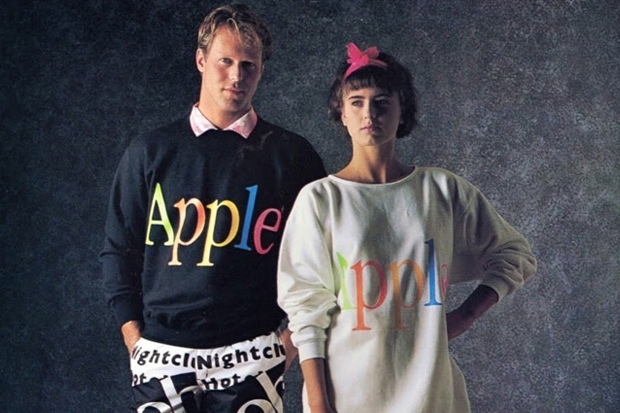 But now that I’ve seen a few mockups of that design, I’ve changed my mind, and come October I would love this to be at the end of those long queues at Apple. In fact, the latest mockups, created by Martin Hajek, look absolutely incredible. 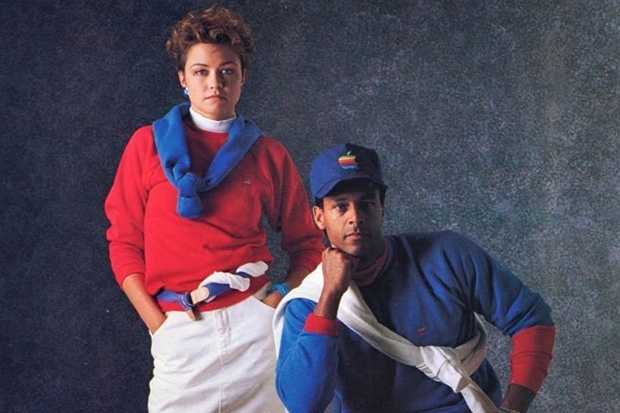 Believe it or not, the tech empire that is Apple once had its foot in the fashion realm, releasing a collection of apparel that truly harks back to the 1980s — an obvious showing of the change in times and style to the current simple and sleek designs. 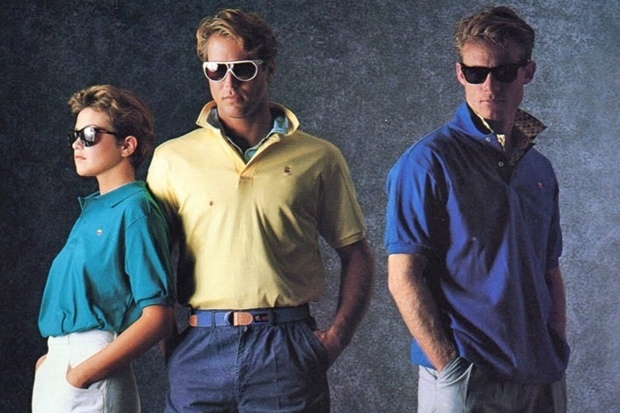 Released in 1986, the old images proudly showcases models in bold and vivid sports-casual wear for men, women and children. Raising an eyebrow from the irony of a fashion line coming from the man notorious for his mock turtleneck tops, the collection still tells of the company’s spirit, best resembled in its rainbow colored logo.